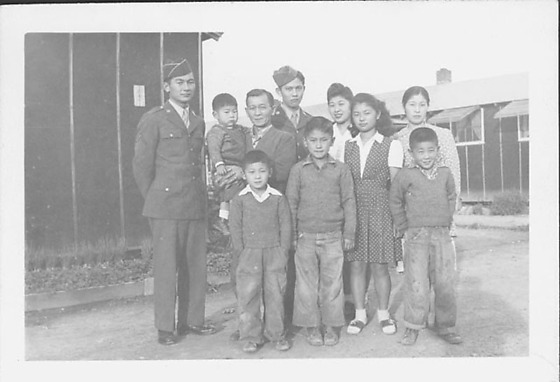 Group portrait of two men in United States Army dress uniforms with large family of eight at Rohwer concentration camp, Rohwer, Arkansas, November 21, 1944. Girl in saddleback shoes and a polka dot pinafore stands between three boys in jeans and sweaters in front. Older man holding small boy stands between two soldiers in dress uniform with garrison caps. Two women stand in back, right. Barracks in background. Stamped in black ink on back: NOV 21 1944.